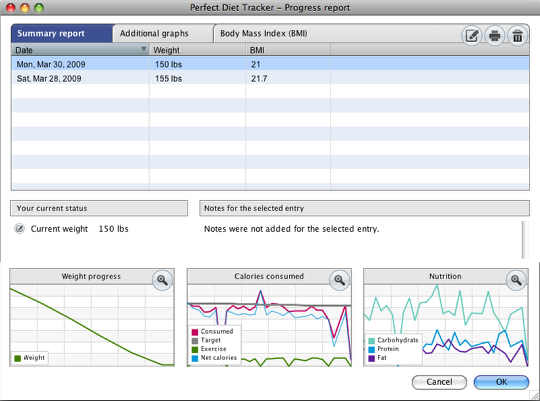 Version 3 of the Perfect Diet Tracker is a substantial update with over 300 improvements to the existing version. Here are some of the improvements and new features, in no particular order…. The main diary window has been upgraded and now makes full use of the available space. Both food and exercise have been integrated into the improved search system, simply enter the product or exercise you are looking for into the search box and the diet tracker will do the rest. Day notes have been added so you can now add notes for each day, and the information panel has been improved and expanded to include a breakdown of the calories consumed and exercise credits. Behind the scenes and core to the new version is the new improved smart search system that learns which products you prefer and gives these priority making the software even easier to use on a day to day basis. The add products window has also undergone significant changes to make adding foods to your diary easier through a clearer window. 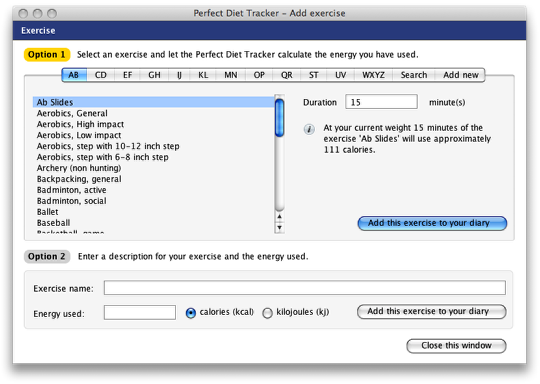 If you are tracking exercise along with your diet you will appreciate the new exercise window. Exercise is now included in the core search system, and like the food product window we have worked hard to improve the exercise window to make adding exercises easy. Update your weight, and anything else! The update results screen has seen a major overhaul. Along with your weight and the previous ‘fixed’ options of chest, hip and waist measurements you can now track an unlimited number of additional items, simply adding new fields or deleting the ones you do not want to track. Any additional fields you add can be charted later in the reports section. New reporting options, better graphs and charts! The reports section has been totally re-written to allow the tracking of unlimited fields, and integrate our new graphs and charts. All graphs and charts can be viewed in detail and printed, the BMI screen has also been improved to improve the clarity of the report. The reports section has been totally rewritten to allow for the tracking of unlimited fields, and integrate our new graphs and charts. 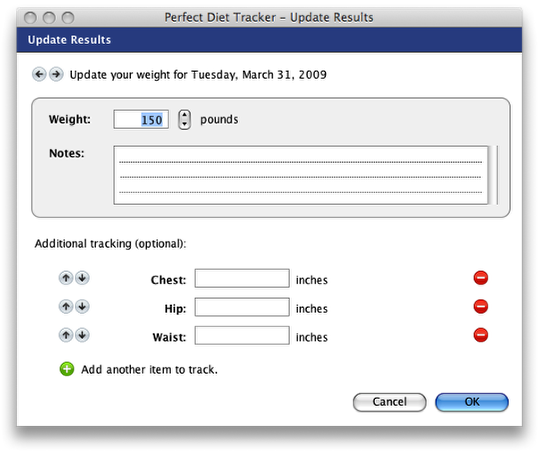 It doesn’t matter what sort of computer you have, the Perfect Diet Tracker will work, and has been optimized for your computer. Version 3 improves ‘cross platform’ support, each platform has its own build with identical features but small optimizations so it works in the way you would expect an application to work on your machine. The window controls are in the right place, buttons in the right order and the fonts used are those used by your system, all steps designed to make using the new version seamless and easier than ever. To view all the features the best option is to download the new free trial version. Don’t worry if you have used the software before and that trial expired, version 3 has its own new trial period so you can try it again. 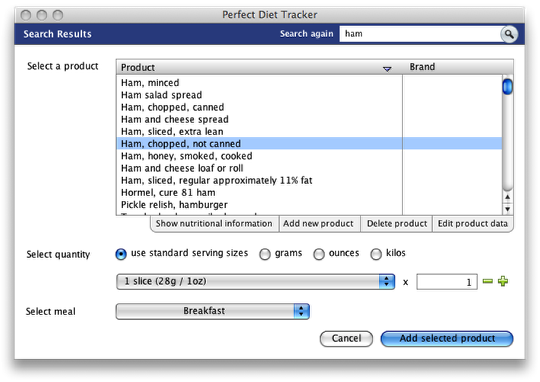 We hope you enjoy the all new Perfect Diet Tracker! Will I loose all the foods I added and the groups I created by upgrading to version 3? Will I loose my history of food and weight entries? Does the new version allow me to duplicate a food from one day to another? 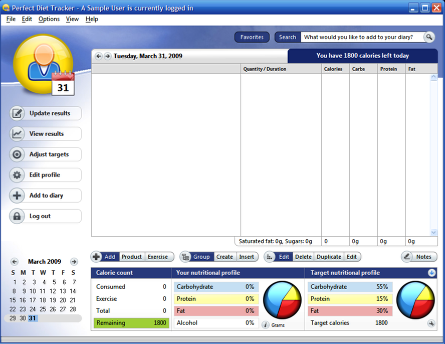 Version 3 has full access to all your existing foods and groups, and your history of food and weight entries. Version 3 adds to the existing v2 databases so the versions are interchangeable, any new v3 specific data will simply not show if you decide not to upgrade after the new trial and go back to version 2. The new version does let you copy and paste foods between days and users, just use the right click on a windows system or hold down the cmd key while clicking on an mac to access the quick menu. Do you have updates of your food and exercise information separate from program updates? i.e., can someone get updated information without having to upgrade the program? If you have the internet search option enabled, updates to the food database will be made automatically. This is not version specific, so you will have the latest food data if you are using version 2 or 3 as long as the internet search option is enabled. Will there be a report for the food you eat for the week? I want to be able to show my dietian. Yes, if you select the print option from the file menu you can then enter a date range (for example the last week) and select the ‘summary report’ option to print a report for that date range. You can also print the detailed diary for the date range if your dietitian would prefer more detail. Is there any way to create and save common recipes by combining ingredients that are already in the database? Is there any way to switch from serving sizes being in grams to cups or tsp/Tbls? We are working on the recipe module at the moment and hope to have it available as a free upgrade very soon! This feature is now available! Can you publish your progress to Facebook or Twitter? Yes, this has been added in a recent update, thanks for the suggestion! I see you have some folders in your application package that makes me wonder if you plan on having support for other languages, are you? Yes, we plan to add support for other languages and the support structure for the other languages is now in place. Im afraid we do not have a timescale at the moment. Please provide a version history so users can determine changes made. Thank you. If you click on the version number shown on the login screen, or use the help menu and select ‘check for updates’, this will check for updates and also shows the current version history, along with details of any changes so you can see if you would like to upgrade, and what changes to expect if you do. I hope this helps. Can you input recipes into the food database to keep track of your calories? Yes, you can use the groups function to create and manage recipes, and add these to your diary.